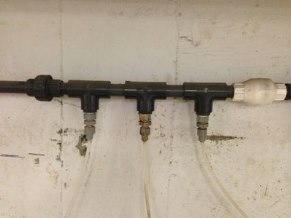 Water Treatment Chemicals Are Right, But The Feed Location is Wrong? One of the most common problems that we see in water treatment when we survey a new customer’s facility is improper chemical feed location. Our water treatment professionals evaluate dozens of chemical feed stations in many different types of facilities every month, and we are always concerned when we see the same type of problem over and over again. Water treatment chemicals being fed in the incorrect location is one of those problems. This issue is even more peculiar because many times we will find that the actual water treatment chemical program and methodology is very appropriate for the system being treated, however, because of how that program is being fed into the system, the results are less than desirable.